The fruit that took over the world. No, it’s not a long-forgotten sci-fi thriller, or even some GMO experiment gone horribly wrong. It is, in fact, something you have likely eaten, in one form or another, within the past week. It’s the tomato. I’m kind of envious of the world tour undertaken by this humble fruit (and yes, contrary to what you may have been lead to believe, the tomato is a fruit, not a vegetable). Originating in the Andes Mountains in South America, it soon became a domesticated crop that was, by 500 BC, being grown as a food source throughout the Mexican peninsula. One of the early Spanish explorers — perhaps even the fabled Christopher Columbus — returned to Spain with the seeds of this fruit after a trip to the New World. Although initially suspicious of the fruit of any plant in the deadly nightshade family, Spaniards couldn’t resist the juicy, sweet tomato, likening it to an eggplant. Those same explorers were responsible for introducing tomatoes throughout the Caribbean, Southeast Asia, and the Mediterranean. Climates in countries like Italy were especially favorable for growing tomatoes, though the Italians in the 1500 and 1600s used them originally as ornamental fruits, believing that they were not edible. That changed, obviously, and thank goodness it did, or we may never have gotten the opportunity to experience pizza in its many forms and permutations. Tomatoes continued to migrate — north to France and Great Britain, south and east through the Middle East and Africa, and, eventually, made their way back across the ocean…this time to North America. So the next time you cut one of these beauties into a salad, make a batch of salsa, or serve a simple vegetable soup, think of all the places the tomato has been. And all the passport pages it must have gotten stamped. Now, that’s a trip I want to go on! Speaking of trips, the Stout Sprouts and I have a simple recipe for baked tomatoes that could take you no further than your garden, or just the produce aisle of your local grocery or farmer’s market (can’t WAIT for Jersey tomatoes to come into season here). If you’re having a big barbecue this weekend — ’tis the season, after all — this is an easy side that is a great complement to steaks or baked chicken or a hearty rice dish and takes absolutely no time at all to make. 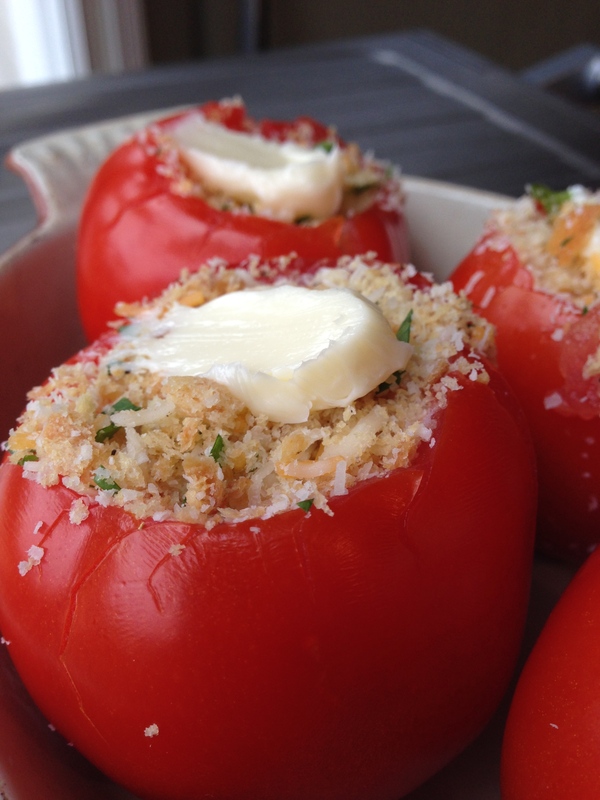 This recipe for Baked Tomatoes is a vacation for your mouth. Check it out and remember to come home when you’re finished! Recipe Index – Find Your Favorites Here!